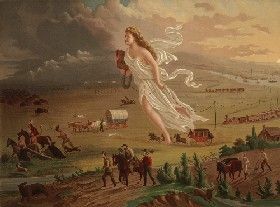 American Progress by John Gast in 1872. Click for prints & products. In the great wars of American history, there are, in immediate connection with the army, two situations in which woman more prominently appears: the former is where, in her proper person, she accompanies the army as a “vivandiere,” or as the daughter of the regiment, or as the comrade and help-mate of her husband; the latter, and less frequent capacity, is that of a soldier, matching in the ranks and facing the foe in the hour of danger. During the American Revolution, a large number of brave and devoted women served in the army, principally in their true characters as wives of regularly enlisted soldiers, keeping even step with the ranks upon the march, and cheerfully sharing the burdens, privations, hardships, and dangers of military life. In some cases where both wife and husband took part in the struggle for independence, the wife even surpassed her husband in those heroic virtues. The name of Mrs. Jemima Warner has been embalmed in history as one of those remarkable women who was seen at once the true wife, the heroine, and the patriot. She appears to have been a native of Lancaster, Pennsylvania and became the wife of James Warner, a private in Captain Smith’s company, of Daniel Morgan’s rifle corps. In 1775 she followed her husband to the north and joined him at Prospect Hill, Cambridge, in the fall of that year. Morgan’s riflemen were picked men and were sure to be placed in the posts where the greatest danger threatened. But James Warner, though a stalwart man in appearance, possessed none of the qualities demanded in extraordinary emergencies. If ever a man needed, in hardship and danger, a constant companion, superior to himself, it was private James Warner, and such a companion was his wife Jemima. She is described as gifted with the form and personal characteristics of a true heroine, and the heroic qualities which she displayed through all the romantic and tragic campaign against Canada prove that her spirit corresponded to the frame which it animated. The Canadian campaign was in many respects the severest and most trying of any during the Revolution. 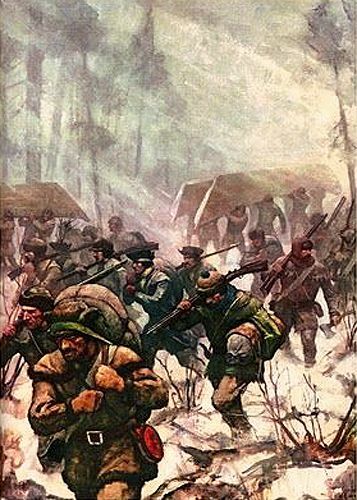 General Arnold’s march through the woods of Maine was attended with delays, misfortunes, and losses which would have discouraged any but the bravest, and most determined and hardy. The strength and fortitude of the men was tried to the utmost, by wearisome marches, floods, winter’s cold and famine, and in these crises, private Warner was one of those few whose soldiership failed to stand the test. Jemima, who had not noticed her husband’s disappearance, started back in search of him. Warner was no worse than many of the other men, but his fortitude had given out. Begging his comrades to delay their march for a while, she hurried back in search of her husband, but an hour passed, and his company marched without him. Without the necessary forethought needed for endurance, he had eaten all his rations, which should have lasted him two days. Knowing that the supplies of the army were exhausted, he saw no hope ahead. His brave wife had had a sad trial with him. From the day that provisions had begun to be scarce, he had been the same improvident laggard. Familiar with his failings, she was in the habit of hoarding food, the price of her own secret fastings, against such need as this. She now exerted herself to the utmost to rouse him and induce him to press on and rejoin his comrades. It was long before she prevailed, and at last, when they started, the army had gone on, and the pair were forced to make their way through the wilderness alone. Refusing to entertain the thought of perishing in the wilderness, she did her best to cheer her husband and drive such thoughts from his mind. Endowed with a strong constitution, and free from disease, the young soldier could have survived the terrible march to Canada, had he possessed but a little of her courage and good sense. Taking the lead in the bitter journey, through swamps and snows, threading the tangled forests, climbing cliffs, and fording half-frozen creeks, — day after day the heroic woman pushed her faint-hearted husband on, feeding him from her own little store of ember-baked cakes, and eating almost nothing herself until they were more than halfway to Sertigan on the Chaudiere River, toward Quebec. Here Warner dropped down, completely discouraged, and resisted all his wife’s entreaties to rise again. It was in vain that she appealed to every motive that could nerve a soldier, every sentiment that could inspire and stimulate a man. Relief, she said, must be before them, and not far away; for her sake, would he not try once more? Her pleadings and her tears were wasted. The faint-hearted soldier had made his last halt. Weak he undoubtedly was, but comparing the nourishment each had taken, she should have been physically worse off than he. It was the superiority of her mental and moral organization that kept her from sinking as low as her husband. Failing to stir him to make another effort to save himself, she filled his canteen with water and placing that and the little remnant of her wretched bread between his knees, she turned away and went down the river, with a heavy but dauntless heart, in search of help. On her way, she met a boat coming up the river, and in it were two army officers and two friendly Indians. Hailing the party, she told them of her distress and begged them to take her husband on board. They replied that it was impossible. They had been sent after Lieutenant Macleland, a sick officer left behind with an attendant, at Twenty-foot Falls, and the little birch bark canoe would only carry two more men. They could only spare her food enough to keep herself alive. Weeping, she turned back and sadly followed the canoe up the stream until it was lost to view. When she again reached the spot where she had left her discouraged husband, she found him alive but helpless and sinking fast. While the devoted wife sat by his side, doing what little she could for his comfort, the canoe party came down the river, bearing the gallant Macleland, their loved but dying officer. Again the hapless wife begged, with piteous tears, that they would take her husband in. No! All her prayers were useless. Macleland was worth more than Warner. When all hope had fled, Jemima stayed faithfully by her husband till he had breathed his last. She could only close his eyes and try to cover his body from the wolves. Then, when love had done its best, she strapped his powder horn and pouch to her person, shouldered his rifle, and set out on her weary tramp toward Quebec. Melancholy as it was, one sees a certain sublimity in the woman’s act of selecting and carrying with her those warlike keepsakes. It was in perfect keeping with those tragic times. Tender thoughtfulness of her poor husband’s martial honor outlived her power to inspire him again to her heroism and made her grand in the forlornness of her sorrow. She was determined that his arms should go to the war if he could not.